One of my family’s favourite pastas is the Spaghetti Aglio Olio, often cooked with ham, bacon & mushrooms. I’ve chosen to use Linguine this time & with seafood. 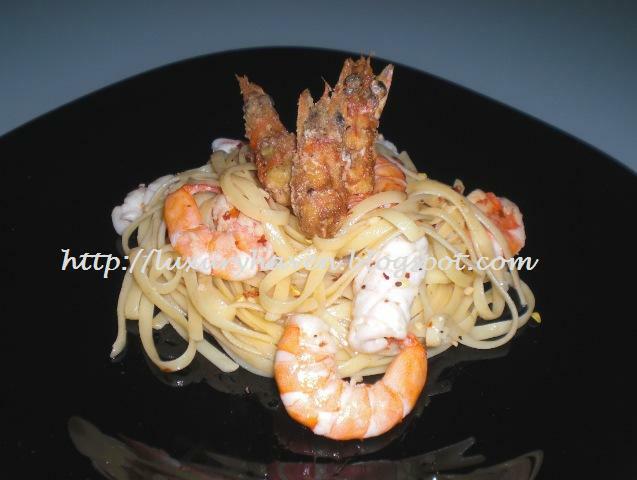 I got this Twin Prawn Linguine inspiration years ago from the Japanese Tempura & Teppanyaki. The prawn heads are lightly coated in tempura batter & deep-fried till crispy in an authentic Tempura cuisine, while the heads are smashed flat & put on the grill till crispy in the Teppanyaki dish. 1. Cook pasta according to instructions. Drain & add a tsp of olive oil or butter to prevent it from sticking together. 2. Separate prawn heads from bodies. Remove shells & devein prawns. Using a pair of scissors, cut away the “legs” & any sharp edges from the head. Rinse prawns. Dispose the top part of shell & & dry the heads well. Marinade heads with salt & pepper. 3. Clean the insides of the squid & remove the skin. Open up the squid & use a knife to make a criss-cross on the back of the squid to form a pattern. Cut into equal slices. 4. Mix flour with pepper & salt & coat prawn heads. Heat oil & deep-fry till golden brown. Set aside. 5. Heat oil & add butter. Put in garlic, then the seafood. Add wine. When seafood’s half-cooked, stir in pasta & mix well. Divide pasta into 3 plates, add crispy prawn heads & serve immediately. This sounds wonderful!! I live in a houseful of prawn lovers so this won't last long on my dinner table! Thanks for sharing a great recipe!! i'll try this soon (: im a prawn head lover too!